Streamline visitor registration, improve access control to an event and special areas, and gather important visitor data with the Litum RFID event management system. Our system is designed specifically to improve logistics and attendee management with RFID technology. Litum provides the fixed gateway readers and handheld scanners necessary to identify visitor ID badges as guests move throughout your event. We also provide a selection of RFID cards with UHF, HF, and dual-frequency options. Visitors can utilize our software at computer stations for self-registration, or event employees can set up accounts and provide badges to visitors at registration tables. The RFID event management system fulfills access control needs at trade shows, expos, museums and galleries, theme parks, or concerts. Use it to reduce man hour costs for extra staff, reduce wait times and lines, eliminate issues with counterfeit tickets and badges, and even set up wireless payment options for event merchandise. 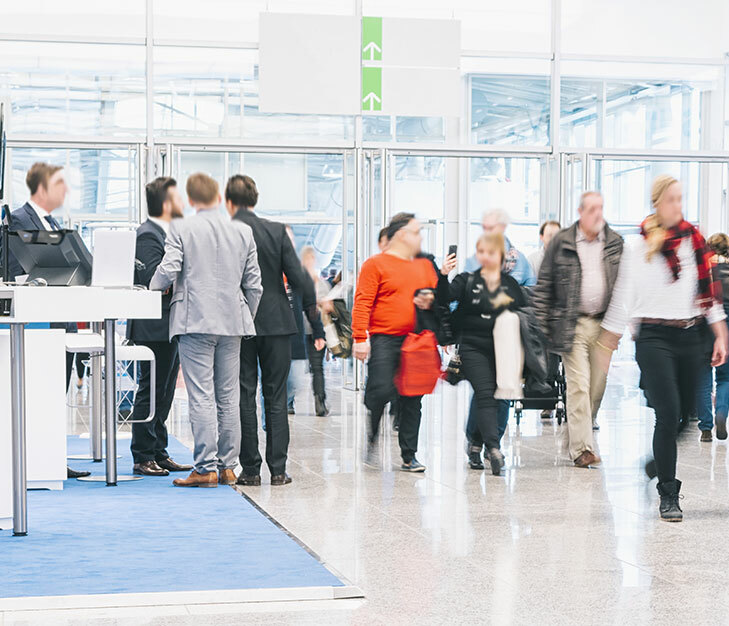 Trade show organizers, event production companies, and theme parks often have trouble controlling unauthorized access to their facilities without making visitors upset by delays or long lines. Many man hours are spent manually checking the tickets and ink stamps of visitors. Even free events can require registration, so organizers can obtain valuable visitor behavior data. Most importantly, event organizers can track the movement data of visitors to see which exhibits are more popular and how long guests linger at each spot. It can also be used for targeted marketing after the event, such as sending specific coupons and mailers to guests depending on the booths visited. This data can also be valuable for improving traffic flow and determining which entry points require more security. Litum specializes in developing wireless tracking solutions for demanding environments where manual observation can be impeded. The large number of visitors, constant turnover, and high security requirements make events an ideal place to implement our expertise.